Synopsis: The Fault in Our Stars meets Eleanor and Park, All the Bright Places is a compelling and beautiful story about a girl who learns to live from a boy who intends to die.Theodore Finch is fascinated by death, and he constantly thinks of ways he might kill himself. But each time, something good, no matter how small, stops him.Violet Markey lives for the future, counting the days until graduation, when she can escape her Indiana town and her aching grief in the wake of her sister's recent death.When Finch and Violet meet on the ledge of the bell tower at school, it's unclear who saves whom. And when they pair up on a project to discover the 'natural wonders' of their state, both Finch and Violet make more important discoveries: It's only with Violet that Finch can be himself - a weird, funny, live-out-loud guy who's not such a freak after all. And it's only with Finch that Violet can forget to count away the days and start living them. But as Violet's world grows, Finch's begins to shrink. How far will Violet go to save the boy she has come to love? I firmly believe the stories we tell are often cathartic processes that help us to deal with the intimacies of being human – and nothing is more intimate or human than loving and dying. Romeo and Juliet, Looking for Alaska, All the Bright Places. They will never get old because every generation struggles with not-living. I wanted to start this review completely differently; I wanted to write how boorishly generic All the Bright Places is, how it’s just another (admittedly enthralling) tale of two sick kids healing each other with their love (haven’t we got enough of those?). But that is not what All the Bright Places is, not even in the slightest; even though it begins like that. Jenniver Niven’s debut YA novel, like many that came before it, is written from a deeper heart. These stories repeat themselves because the things they talk about repeat themselves in the lives of every human being. In the case of All the Bright Places, the stories of young people slipping through the net and drowning are still being told because they still occur daily in every country imaginable. All the Bright Places is the wanderings of Violet Markey and Theodore Finch; both the official, in the form of Indiana’s not-ordinary places; and the unofficial, in the days, hours, minutes spent together. They work on their US Geography project visiting the highest hill in Indiana (1257ft), swimming in the Blue Hole and visiting the Indiana Moon Tree. They recite Dr Seuss and Virginia Woolf. They learn what it means to live and what it means to die. 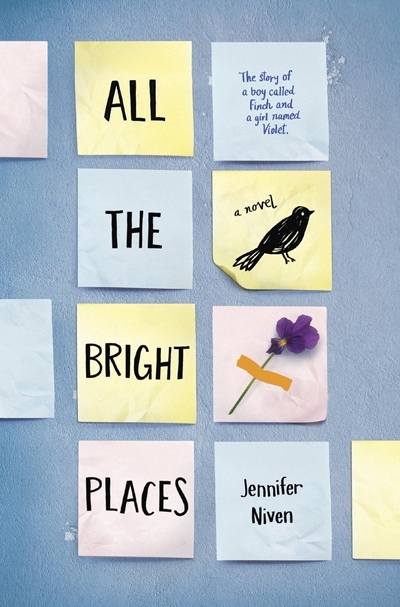 All the Bright Places is Niven’s first YA novel but it’s impossible to tell. It’s written in the alternating voices of Finch and Violet and unlike some oscillating narratives it’s easy to tell the two apart, to hear two distinct yet interlinked stories. Niven successfully captures teenage angst and pretentiousness in her use of Virginia Woolf’s The Waves, which feel less like they are shoe-horned in than a natural part of the narrative. Are Finch and Violet like Romeo and his Juliet? More like Hazel and Gus, or Miles and Alaska? Maybe they are all the same; an archetype of souls that are invented and reinvented again and again and again. Each time they are the same but different; each new story is fresh but inherited. In any case, Niven’s novel is powerful, euphoric and tragic and Finch and Violet’s story is enthralling; it is cathartic. It is hope, it is life, it is overwhelming sadness and ecstasy and confusion. It touches the deepest of human emotions; it will touch yours if you let it. You will feel a thousand capacities spring up in you.